Psychic Skill Items Revealed! This is a photo I took the evening of the original blog post, and the items have remained in these exact places since then. For the previous post, where I introduced the exercise, visit Fun with Psychic Skill! The item on the left is a brick from the Lexington High School/Middle School that I, along with several generations of my family, attended in Lexington, Missouri. I actually attended from the fourth to the eighth grade. 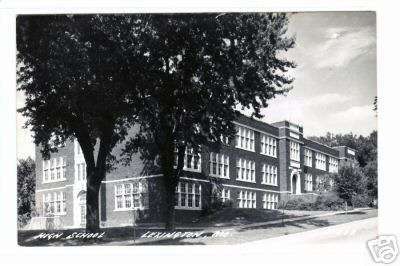 The school, which was built in 1927, was demolished ten years ago. I was hoping someone would get some energy from this item. 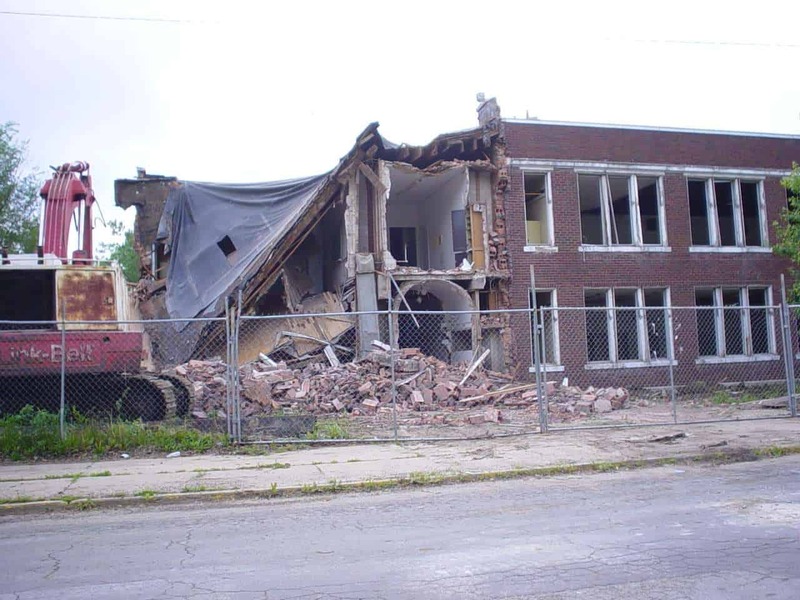 A photo of the demolition of the old school. This view is of the main entrance on the opposite side of the view you see in the black and white photo above. 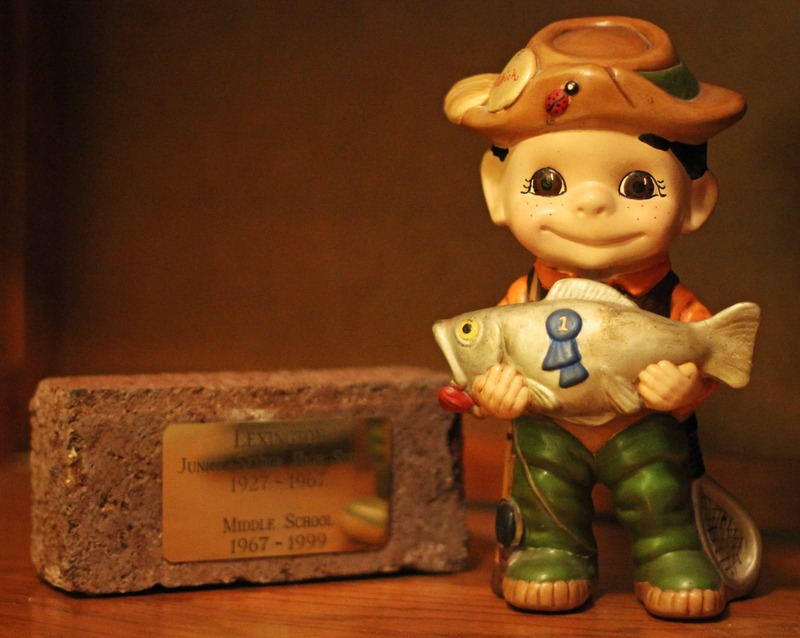 The item on the right is a ceramic boy with a fish that was given to me by an uncle when I was little. I’ve always had it somewhere in my room or in my home since then. Sam Crust mentioned an award in his description, which makes me wonder if he could have been seeing the shiny gold plate with inscription glued to the front of the brick. He also mentioned a toy (specifically, Huckleberry Hound), which is a standing character (two legs, arms, facial features, etc.) similar to my boy with the fish. Kevin D’Arcy mentioned “ceramic”, which is a good call. I can also see how he may have gotten a “bobble head type figure” from my boy with the fish. Paranormalogistically mentioned the characteristics of “square or rectangular” and “box”, which would connect with my brick. I can also see how she could get “bumpy texture like hobnail glass” (which I had to look up to know what it was) with the boy with the fish. She mentioned “keepsake” as well, which I would consider both of these items to be. Both Phyllis and Brandie Sellers used the word “box” in their descriptions, connecting them to the brick. Randall Keller listed several colors, which you could argue is represented somewhere in both items. He also used the term “rectangular”, connecting it to the brick, and “smooth textures”, connecting it to the boy with the fish. Shall we try this again sometime? I really had fun doing this and I hope you found it interesting… or at least entertaining. I’d love to try it again sometime, would you? And if anyone decides to try this on their own, let me know. I’d love to participate. To those who practiced their psychic skill for this exercise, thanks so much! This entry was posted on Sunday, February 16th, 2014 at 1:52 pm	and tagged with big seance, blogging, boy with the fish, brick, ceramic, energy, exercise, exercise in psychic skill, fun, Huckleberry Hound, intuition, learning psychic skill, medium, mind, paranormal, paranormal fun, psychic, psychic descriptions, psychic exercises, psychic fun, psychic skill exercise, psychic skill items revealed, remote viewing, remote viewing exercise, results, reveal, seance, spiritual, telepathy and posted in Mediums/Psychics/Sensitives/Intuition, Paranormal Fun, Topics Inspired by Blog Comments. You can follow any responses to this entry through the RSS 2.0 feed. « Fun with Psychic Skill! What fun! I thought this was very energetic and intriguing. I loved how the responses connected back to the pieces…spooky 🙂 I’d join the next round to flex my psychic abilities. Well good because I’m considering doing another one soon! 🙂 Stay tuned! I didn’t do bad did I? Looks like I got “green” as well. I very much enjoyed this remote viewing experiment and look forward to trying it again sometime. You sure didn’t! Sorry I missed the green characteristic. Do you think people would get annoyed if we did a few more? I think it would be great to do more of these. I doubt anyone would get annoyed…too much fun. 🙂 Sam mentioned an award…could it have been the blue ribbon on the fish? I think this is a pretty cool idea. Mind if I try something along those lines on my own blog sometime? I’m glad you enjoyed it! I’m thinking of trying another one (a bit differently) soon!